THRILLING, GRUESOME AND HAUNTING – ICE COLD ARCTIC CRIME! Foreign Rights so far sold to: Norway (Gyldendal), Czech Republic (Dobrovsky), Italy (Einaudi), Iceland (Bjartur), Finland (Like), Sweden (Albert Bonniers), Germany (Fischer Verlag), The Netherlands (Ambo Anthos), Lithuania (Baltos Lankos), Slovakia (Ikar), Spain (Planeta), Poland (Burda Media), France (Actes Sud), Portugal (Planetas), Estonia (Varrak) and Australia/New Zealand (Text Publishing – World English Rights). Matthew Cave is a 28-year-old Danish journalist. Feeling responsible for the death of his girlfriend and unborn daughter in a traffic accident, his bid to escape reality has driven him to the remote Arctic capital of Nuuk. When a mummified body is discovered on the ice sheet, the first well-preserved Norse Viking ever found, Matthew is sent to cover the story. Everything is set up for a world sensation and the small community is holding its breath. Articles, photo shoots and research teams – everything is in place. But already the next day, chaos breaks out. The mummy has disappeared and the police officer who was keeping watch at the discovery site has been split open and his entrails removed. He is lying naked on the ice with his belly inside out. Back in Nuuk, and to Matthew’s great annoyance, a firm lid is put on the case – both on the sensation with the Viking mummy and the killing of the policeman. Instead, Matthew strays off into a shelved murder case from 1973, where the method of killing resembles the one used on the police officer out on the ice. They are identical murders – except that the four men killed in 1973 had also been flayed when they were found. The same four men were under investigation for sexual abuse of their daughters. Matthew soon realises that two of the abused girls disappeared without a trace while the case was still going on. And the same did the police officer, Jakob, in charge of investigating both the assaults and the murders. For Matthew, the cases from 1973 and 2014 merge and he quickly gets so deeply involved in the bloody murders of the past and present that there is no going back. 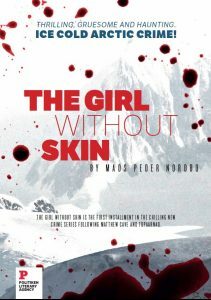 He quickly finds himself as the main suspect in the case and the only person he really dares to trust is a young Greenlandic woman who, fourteen years old, killed her father in the same way as the murders Matthew is working on. Her name is Tupaarnaq. Her body is covered in tattoos. Her skin was worn away when she was a child, but her will is as strong as the mountains around Nuuk. Matthew and Tupaarnaq find themselves in the middle of a dangerous game in which they are not only wanted by the police, but are also having their lives threatened by physical echoes from the past. CRIME SERIES FOLLOWING MATTHEW CAVE AND TUPAARNAQ. Matthew, twenty-eight years old, was born in Thule, Greenland, but has lived most of his life in Denmark with his mother. His father was a US soldier at the Thule base, while his mother was a nurse there. His mother is Danish. His father went missing from Matthew’s life when he was four years old. Matthew is a journalist, educating himself with big dreams and a lust for life. Matthew is plagued both physically and mentally after the loss of his girlfriend and his unborn daughter. When the book opens, he has been in Nuuk for almost two months. The accident is over a year old. He is in a vacuum where he is not in control of what he wants in his life, but some big stories which affect him deeply get him back to life – as does the meeting with the strong, young woman, Tupaarnaq. Tupaarnaq is a few years younger than Matthew. She has been in prison for 12 years fo r killing her family. She was found beside the bloody body of her father with the murder weapon. In the next room, her mother and two little sisters had been shot dead. She had been found guilty by the media before the case went to trial. She was convicted of killing them all but never admitted to anything except the murder of her father. In prison, she has been studying law and doing weight training. Her head is shaven and her body completely covered with tattoos, apart from her head, face, hands and feet. Tupaarnaq hates men, but she and Matthew are thrown together by circumstances and a different kind of friendship begins to take shape. Lyberth is a national father figure and former politician, on his way down because of corruption and a grim case from the 60s’ and 70s’ Greenland concerning abuse of under-age girls and the murders of their fathers. Abelsen is Greenland’s most powerful civil servant who has worked closely with Lyberth since the early 70s. He is a man who has been brought up in a malignant way and has found his path to the top by sweeping every problem aside – regardless of the method. Jakob is Danish and in his forties. He lived in Nuuk in 1973 and for many years before that. He is a police officer in a Nuuk which is even more cut off from the rest of the world than today. During his work, Jakob has stumbled across a number of ugly assaults against under-age girls – and is investigating them without the permission of the chief of police. Jakob has a notebook where he makes private notes partly about his work on the case. Some of his notes are about the case with the girls and he has a list of four men who he is convinced abuses their own daughters. When the men start dying, the case speeds up. Jakob comes into conflict with the chief of police and ends up as the prime suspect for the murders. Paneeraq is a young Greenlandic girl, eleven years old, who Jakob is convinced is being badly sexually abused at home. Paneeraq has been in a tuberculosis care home in Tasiilaq for several years, but in November 1973 she is back in Nuuk. She was in the care home along with four other girls of the same age. Paneeraq quickly establishes ties with Jakob. Like him, she disappears without a trace on the last day of the parallel story, but reappears in 2014 when Matthew starts digging in the case. Najak is a young girl about the same age as Paneeraq. She disappeared in 1973 without a trace before we meet Jakob for the first time. Mads Peder Nordbo is Danish but has lived in Nuuk, Greenland with his wife and daughter for several years. Born in 1970, he hold degrees in Literature, Communications and Philosophy from The University of Southern Denmark and the University of Stockholm. Mads has lived in Denmark, Sweden, Germany and Greenland. He works in communications at the Town Hall in Nuuk, where he amongst other things, writes for the mayor of the municipality, Kommuneqarfik Sermersooq, which stretches across the Greenland ice sheet. Through his work Mads has access to information about everything from social conditions to the political situation in the small Arctic community. 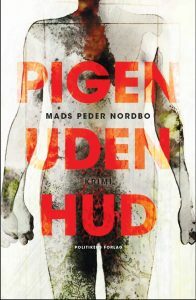 Mads Peder Nordbo is the author of three novels. The Girl Without Skin is his debut as a crime writer. Almost 17,000 people lived in Nuuk in 2014. About 6,000 in 1973. Greenland has the world’s highest suicide rate and the Nordic region’s highest abortion rate. The murder rate is 16 times higher than in Denmark. Two-thirds of all women in Greenland are subjected to violence. A third of all girls are subjected to sexual abuse before the age of 15. Politiken Literary Agency is part of JP/Politiken Publishers, one of the largest Danish publishing houses of trade books and the home of Politikens Forlag, Jyllands-Postens Forlag, and Ekstra Bladets Forlag. The publication line includes fiction, children’s books, non-fiction, current affairs, documentary and travel guides. The publishing house also runs a fullstore bookshop in Copenhagen. The company is owned by one of the largest Danish media-houses, JP/Politiken Newspapers Ltd., with three leading newspapers, local newspapers, book publishers, television production and digital activities.